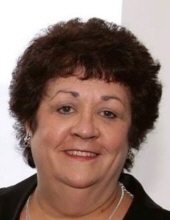 Lorraine Alongi (nee Angelozzi), age 62, died on March 24, 2019. Born and raised in South Philadelphia, Lorraine graduated from St. Marie Goretti High School. She has lived in West Deptford over 35 years. Lorraine worked as a Construction Loan Officer for various banks and most recently worked for TD Bank in Cherry Hill. She was a member of Holy Angels Parish (St. Matthew's Church). Her greatest joy was being a 100% devoted wife and mother. She is survived by her husband of 38 years John, sons Matthew and Christopher, her mother Edith Angelozzi and siblings Frank (Lois) Angelozzi, Janice (Bernard) King and Perry (Patricia) Angelozzi. She was predeceased by her father Frank Angelozzi. Friends may greet the family on Thursday 7-9pm in the Budd Funeral Home, 522 Salem Ave (Kings Hwy), Woodbury, NJ and on Friday 10-10:45am in St. Agnes Church (Our Lady of Hope Parish), 701 Little Gloucester Rd., Blackwood, NJ 08012. Funeral mass will be at 11am. Interment St. Joseph's Cemetery, Chews Landing. Those desiring may make a contribution to the American Cancer Society, 1851 Old Cuthbert Rd., Cherry Hill, NJ 08034 (https://donate3.cancer.org/). Memories may be shared at www.buddfuneralhome.com. To send flowers or a remembrance gift to the family of Lorraine Alongi, please visit our Tribute Store. "Email Address" would like to share the life celebration of Lorraine Alongi. Click on the "link" to go to share a favorite memory or leave a condolence message for the family.